Three US soldiers have been killed and two others wounded in an ambush in Niger near the border with Mali, the US Africa Command has said. Another soldier from a "partner nation" had also died in the attack, it said - without specifying their nationality. The US soldiers had been providing advice and assistance in Niger's counter-terror operations and come under "hostile fire", it said. Islamist militants, including al-Qaeda fighters, operate in the region. They are most active in neighbouring Mali, where French troops intervened in 2013 to prevent them from advancing on the capital. US President Donald Trump has been briefed by his chief-of-staff, John Kelly, about the attack, White House spokeswoman Sarah Sanders said. 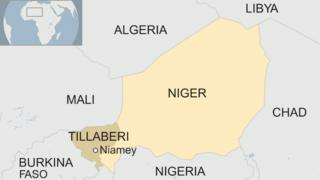 The attack happened 200km (124 miles) north of Niamey, the capital of Niger, the US Africa Command statement said. The two injured US soldiers had been evacuated to the Landstuhul Regional Medical Centre in Germany and were in a stable condition, it added. According to the New York Times, those killed were special forces soldiers and were the first Americans to die as a result of hostile fire since the US Africa Command deployed in Niger. Earlier, an official from Niger's Tillaberi region told Reuters that five Nigerien soldiers were among the dead. It is not clear who fired on the soldiers. Militants belonging to al-Qaeda in the Islamic Maghreb (AQIM) - an affiliate of al-Qaeda - are active in the region and are known to have conducted cross-border raids. This attack will draw attention to the presence of US troops, not just in Niger but in other countries too. In a letter to Congress in June, President Trump confirmed there were 645 military personnel deployed to Niger to support counterterrorism missions there. The US has long maintained that its troops play a "train, advise and assist" role with its partners, whether in the Sahel or the Horn of Africa. Its acknowledgement that the troops in south-west Niger were carrying out a "joint patrol" with local forces is being explained as the US providing "security assistance" but it is not clear how broadly this assistance is defined. The attack also highlights the scale of the jihadist threat in Niger, a vast nation with a varied jihadist presence - Boko Haram in Nigeria, militants linked to both al-Qaeda and so-called Islamic State in Mali, and uncertainty from unstable Libya in the north. For as long as the regional jihadist threat remains, the US and other Western powers will continue to strengthen their presence on the ground. Their target, the jihadists, will also be motivated to take them on.